We're not going to make jokes about putting your own salad together at Ikea, but it can be done from now on. The furniture giant has been growing lettuce in a container farm near their stores in Helsingborg and Malmo sinds early this year. Yesterday Catarina Englund, global sustainability innovation manager, announced the harvest of their first lettuce from what they call their "on-going circular urban farming tests". "Together with Bonbio we are testing how to become self-sufficient in growing our own local salad", Catarina explained. "We can harvest 15-20 kg per day from this container. In addition, we are using our own food waste from the IKEA store to produce a nutrient solution in Bonbio/OX2 biogas plant. The aim is to establish a closed circular food loop. We all look forward to follow this interesting tests", Catarina explains. Bonbio is a waste processing company and has been working with Ikea to valuate their food waste for a longer period by now. "The majority of IKEA Sweden's food waste already goes into various biogas plants, including the biogas plant in Helsingborg, which is run by our sister company OX2 Bio", they explain. "At the biogas plant, Bonbio refines the food waste into plant nutrients, which are then used to grow leafy lettuce in the specially built cultivation containers right next to the IKEA department stores. 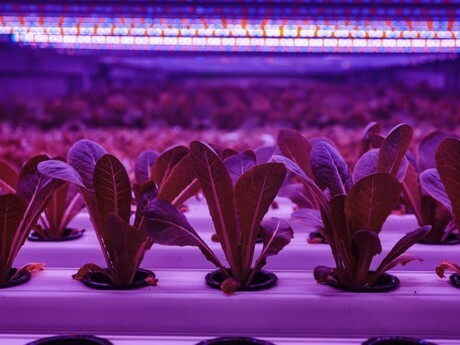 By controlling light, temperature, irrigation and nutrient supply, we are independent of the seasons and can secure a large production of locally grown and fresh plants all year round." Ikea has been active for a longer period in the hydroponic industry. Back in 2016 the introduced a line that lets consumers grow their own lettuce and herbs on water. Last year, they've invested in Click & Grow, a producer of smart indoor gardens. This year in May they are to announce the results of their collaboration with Tom Dixon, a UK based industrial designer that will 'explore urban farming, making homes the new farm land.' The ambition is to find affordable and forward thinking solutions that can be used to grow plants and vegetables at home and beyond. But now it's all about the harvest of the first lettuce. Initially, the salad will be served in the department stores' staff dining rooms. "We're hoping to serve the salad in the customer restaurants in the coming year."